Friendly B&B in a historic property within walking distance of Kingston 's downtown. Extremely pleasant staff, clean, and fantastic food. We didnt get to stay there..were moved to a different hotel as there was something wrong with our room. Staff made this transition awesome and were super helpful...wuth there level of service we didnt mind the change one bit. There is in fact a secret garden. I highly recommend this b&b. Enjoyed everything about this hotel, very friendly staff, great breakfast, convenient parking, good restaurants close by, close to Queen's University. Near downtown and Queen's University. visit the queen's university, island tour. Queen's University is located in a welcoming area of Kingston known for its array of dining options. Kingston is home to 45 hotels and other accommodations, so you can find something that's perfect for your stay. Four Points by Sheraton Kingston: This 3-star hotel features a restaurant, an indoor pool, and free WiFi. Our customers like its family-friendly amenities and WiFi. 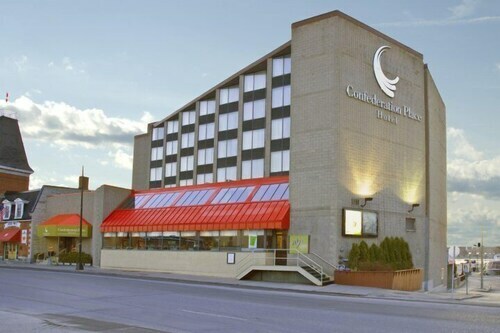 Confederation Place - Hotel: With a stay at this 3-star hotel, guests can enjoy access to free breakfast and an outdoor pool, along with free WiFi. It's a favorite with Expedia travelers for its dining options and overall value. 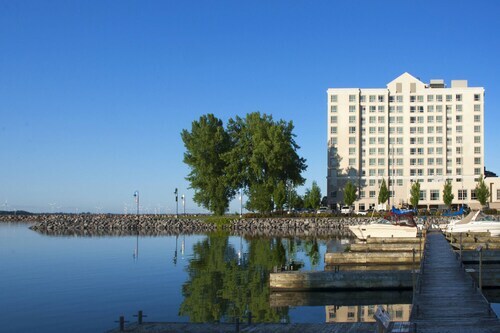 Holiday Inn Kingston Waterfront: With a stay at this 3-star hotel, guests can enjoy access to a restaurant and an outdoor pool, along with free WiFi. It's a favorite with Expedia travelers for its dining options and central location. While you're in town visiting Queen's University, you can explore everything there is to see and do within a few miles of the area. Agnes Etherington Art Centre, Museum of Health Care, and Pump House Steam Museum feature a variety of fascinating exhibits to see while you're in town. Bellevue House National Historic Site, Cathedral of St. Mary of the Immaculate Conception, and St. George's Cathedral are notable landmarks to explore if you're in the area. You can enjoy live performances at The Grand Theatre and Grand Theatre. Kingston Waterfront and Leon's Centre are both worth a visit while you're checking out the area. Kingston City Park is also located 0.2 mi (0.4 km) from Queen's University, and Marine Museum of the Great Lakes is 0.6 mi (1 km) away.